YEREVAN, AUGUST 3, ARMENPRESS. The scandalous article on the business activity of Azerbaijan’s ruling elite has been removed from the website of the Israeli Haaretz newspaper. Official Baku has made several statements over the article. 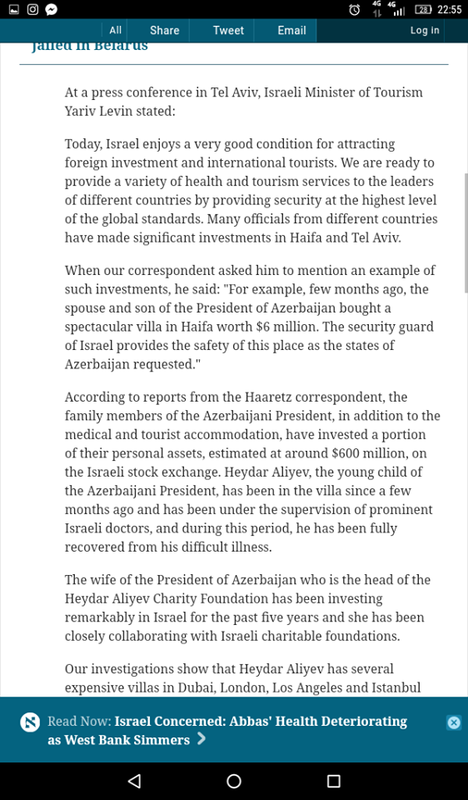 On July 30 an article has been published at Haaretz about the secret businesses and property of the family of Azerbaijani President Ilham Aliyev in Israel. 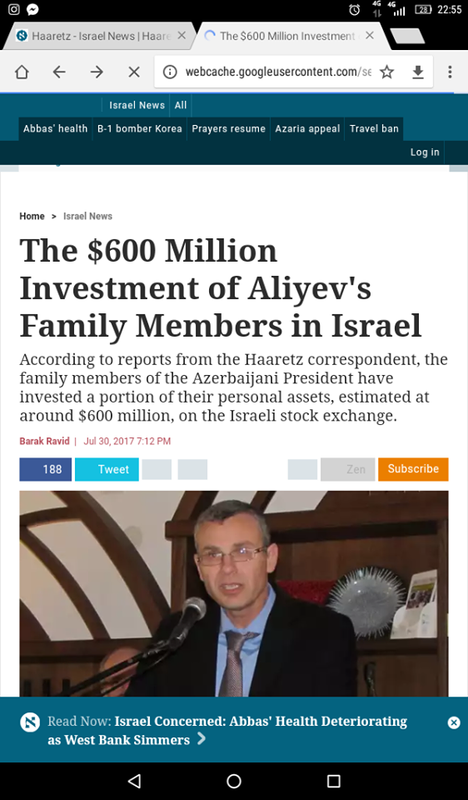 The newspaper wrote that during a press conference in Tel-Aviv, Israeli minister of tourism Yariv Levin, talking about the investments made in Israel, also mentioned the investments made by the Aliyev family in the country. “For example, few months ago, the spouse and son of the President of Azerbaijan bought a spectacular villa in Haifa worth $6 million. The security guard of Israel provides the safety of this place as the states of Azerbaijan requested”, the Israeli minister said. According to Haaretz reports, Heydar Aliyev, the young child of the Azerbaijani President, has been in the villa since a few months ago and has been under the supervision of prominent Israeli doctors, trying to be recovered from his difficult illness. “The family members of the Azerbaijani President, in addition to the medical and tourist accommodation, have invested a portion of their personal assets, estimated at around $600 million, on the Israeli stock exchange. The wife of the President of Azerbaijan has been investing remarkably in Israel for the past five years and she has been closely collaborating with Israeli charitable foundations”, Yariv Levin said. However, the article is no longer posted at Haaretz. Minutes later after publication of the article the Azerbaijani media released numerous materials denying the article, even the statement of Israeli Ambassador that the article at Haaretz is ‘fake’ news. But the scandal undergoes new developments. The examination of Armenpress reveals that there can be no talk about ‘fake’ news. In fact, the scandalous article has been published at Haaretz the evidence of which are the ‘screenshots’: the material is still in Google cache. Moreover, all the links in the maintained part of the website work correctly which also confirms that the news that created Baku’s counter reaction is nothing more than an article that has been posted on the website and later was hidden. Both Haaretz and the Israeli minister of tourism have not made any statements on the article being as fake. There is also no doubt about the professionalism of the author of the article who has a long and significant experience in journalism. It’s worth mentioning that the journalist has not published any article for Haaretz from July 31 up to now. There have been numerous statements on the Alivey family’s wealth, there has been even an offshore international scandal, however, no high-ranking official has ever talked about this. The Azerbaijani authorities always perceive with pain the reports on their wealth and luxurious lifestyle. Numerous journalists have been jailed or persecuted for those reports.